Looks like we will be crawling back up to 10,700 or higher. If that's the case, I am out for now until more earnings come out and I see an opportunity. Updates usually posted at 11:00 - 11:30 a.m. eastern time. Another positive day for the dow. Still 500 short of the highs we had hit. The stop set on SSN should be up to .40 now as it trials by .10 cents. QTWW still under heavy control by one single entity. Tthere was more good news on SSn - they struck oill and gas. QTWW has yet to run up too. We got an up day! An 'at-a-boy for the Bulls. My two small caps didn't move much, which is nice if the market is falling, but not so when the Market pushes upward. I am still undecided on which way the markets will go. I am watching UAUA hover at it's 52 week high. My current puts are considered lost - equal to what my sell stop would have been had I bought it. I am looking at more puts for March 2010 or possibly shorting it. UAUA - set to sell short at 14.95 in case things fall apart. I will watch put prices and if I can get some puts at .02 to .03 per - I will grab some contracts. Maybe March, or April. QTWW will not be sold until the second or third day of the coming run-up - to be sold on a wide trailing stop, in order to give it room to fly. It was a fairly choppy, flat day yesterday. The Dow is showing volatility which is what I like. SSN broke out and UAUA is hitting new 52-week highs. I never recommend making buys during the first 30 minutes of trading. Ideas will be in the form of an update - if any. Normally I thrive on a volatile market such as this. Honestly I have been on the sidelines for a few weeks as things were flat. I feel we will continue downward at a crawl, just as we climbed at a crawl, with sudden bursts of activity on the way up. Today we see another choppy day, and I am comfortable being heavily invested in two stocks that generally don't follow the Dow or any other index. 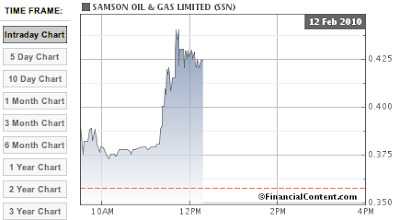 SSN broke out today gapping up significantly the news : Samson Oil & Gas Advises on the Gene #1-22H Well Progress. This has pushed me well above my initial purchase price. As with QTWW, I started buying SSN when it hit .31 and continued - still buying as it reached .20 - and held through a public offering. This is a low volume stock which I have been trading for over 4 years. The company is solid and well positioned for its size. Still a lot of sentiment to the negative side today. The market tried to move up but we got another camel hump. Big news for UAUA - all positive for a stock that will not fall anyway. This breaks all tradition of Airlines dropping after the holidays. With 900 points shaved off the Dow, UAUA has barely reacted and now I can kiss my put options good-bye. The loss is the same as if I had bought it and sold on a stop loss. Despite oil prices, SSN is holding and QTWW is rising a bit but still under control. The market opened choppy today. It's anyone's guess as to what the next move will be. I am comfortable staying on the sidelines for now. My trading style plays major volatility, so flat days won't see any action from me. So far the call limit at 0.21 for TS has not executed. SSN and QTWW will run up when they are ready. I am long on QTWW and will set a trailing stop when it turns positive for me. As soon as controlling entities let go, this one will run. Well, we had the day I anticipated, and the dow nearly hit 10k again. SKF did well but we lost in on a very conservative sell stop. This on a one day bear market rally. The put options below should pan out before expiration if things continue the way they are. I have to say though, UAUA is showing exceptional resilience, bouncing between the mid 12's and 14.00 per share. I had not expected that. UAUA has stayed within an .80 cent range despite the Dow dropping 800 or so points. This amazes me. My put option should have worked out similar to that of TS. Ether way, my opions investments are minimal.Usually 10 contracts or less. I Sold the put options on TS (TSWNH) just after the 2 pm bounce. I got $1.00 per share (cost basis $0.25) essetially quadrupling my investment. I am checking how much Feb. calls are going for - strike 45. TS is notoriously good for bouncing back, all in all, a very good performer. Here is the Option Chain for TS calls. Current price is 0.25 (as it was for the put we bought). 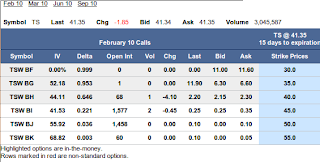 If things fall apart today, we will add TS call options to our portfolio. Again - risk no more than you would be comfortable with on a normal sell stop-loss. We can adust our buy limit tomorrow if things continue down - we want in cheap. We had a surprise up day yesterday. Not good for our short positions nor our put options. SKF sold off on the sell stop of 23.60 for a tolerable loss. It seemed that traders were very slow to dump it as if all were thinking the market may take a turn downward as it has for the last 8 or so sessions. Nothing new until we see a move in one direction or another. Well, after so many days in the red, we finally pulled off a positive day. For that very reason, we have sell stops on the larger positions. SKF didn't even come close to our sell stop. If the day starts off positive again today, the new rally of late might be believable, and we could lose that position for a tolerable loss. My guess is that negative sentiment will resume. There was much positive news on QTWW and SSN today and the reaction was kept under control. Updates as warranted. . .